After nearly sixty years of inactivity, the kilns at Jingdezhen were restored by the Kangxi emperor around 1680. Considered to be one of the greatest Chinese emperors for the progress in the natural sciences and the arts China made under his rule, the Kangxi emperor reigned from 1662 to 1722. During this time, the Jingdezhen kilns flourished, with over 3,000 public and private kilns in operation by 1712. Richly-colored porcelain became abundant as ceramicists and decorators mastered new techniques, resulting in deep yellows, greens, aubergine, and blues being used alongside one another. 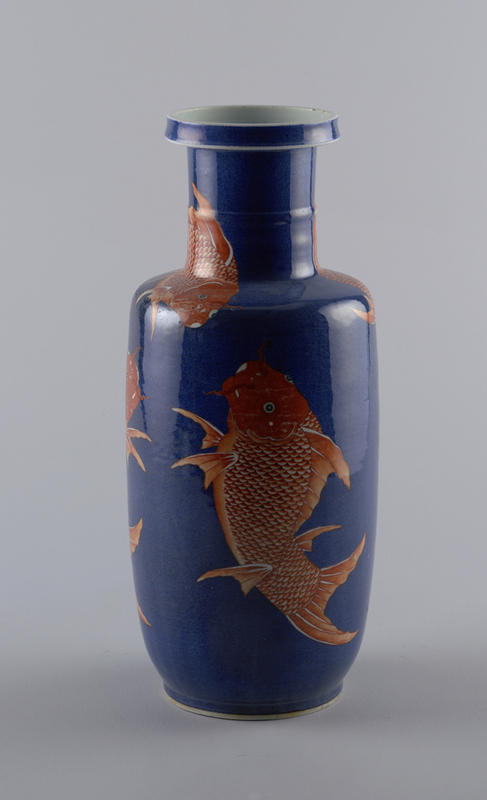 This vase is one such example, displaying the cobalt blue and copper red underglaze combination mastered by craftsmen in the late seventeenth century. Standing at just under a foot and a half tall and nearly seven inches in diameter, this cobalt blue vase is noticeable for its form alone. What I find truly eye-catching, however, is its pattern: several enormous, stylized red carp traverse its surface with no indication as to why, but the unusual motif is actually fairly common in China and refers to the myth of how fish attain dragonhood. As the legend went, a carp swimming upstream decided that it would reach the top of a mountain; it swam further and further upstream and finally reached the peak, where it found the waterfall of Lung-men, or Dragon Gate. Upon ascending and jumping over the top of the falls, the carp transformed into a dragon. Symbolic of perseverance, the carp and its story are maintained in modern culture as encouragement for Chinese young adults studying for difficult national exams, their own proverbial Dragon Gate. Josepha Sherman, ed. Storytelling: An Encyclopedia of Mythology and Folklore (New York: Routledge, 2015). Vase; China, 17th–18th century; Glazed hard-paste porcelain; H x diam. : 43 x 17.5 cm (16 15/16 x 6 7/8 in. ); Gift from the Collection of Stanley Siegel.